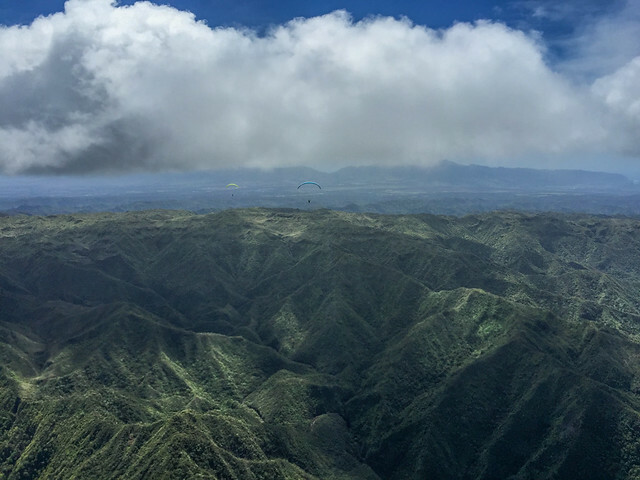 The forecast made it look like we'd have a brisk day on our hands, but it turned out to be just about right, with plenty of room for thermaling and cross country flights in all directions from Kahana. We got close to four grand and logged eighteen miles over stunning scenery under the highest cloud base we've seen in many weeks. The Weather Service summed up the day in the afternoon forecast update: a nice day today as a patch of dry air passed through the island chain. The dew point sank to as low as the mid 50's on Oahu under relatively moderate to locally strong trades. Roll call: Thom, Ike, JK, AK Allen, me, Woody, Drew, Allegra, Marc. Steve, Matt, Anne, Ki, Duck. Maybe a few others. Thanks to JK's friend Annie for the timely retrieve. Thanks to Allen and Drew for the refreshments! Truly unexpected and well needed. Got to stretch from Haaula to Kualoa. Fun day I only got to 3300 max I think.